If your audience has a lot of stale email addresses, you may want to reconfirm them outside of Mailchimp. Stale addresses are old or invalid emails that haven't been sent to in a long time, which can lead to high rates of bounces, spam complaints, and unsubscribes. To reconfirm, you'll unsubscribe stale addresses from your email marketing and reach out to them outside of Mailchimp with a link to your signup form. In this article, you'll learn how to reconfirm addresses. If your contacts are stored outside of Mailchimp, and you want to add them to a reconfirmed Mailchimp audience, you'll follow a slightly different process. Create a new audience in Mailchimp, and then skip to Get your Signup Form URL. You'll have to send your reconfirmation message outside of Mailchimp with a personal email account to protect your sending reputation. If you use Mailchimp to send your reconfirmation messages to unengaged subscribers, the reconfirmation message itself may throw red flags to our Compliance Team. To reconfirm addresses, you'll export your audience, bulk unsubscribe the subscribed contacts, and send the unsubscribed contacts a link to your signup form. When the export is ready, click Export as CSV. Your export file will include separate CSVs for each type of contact. For this process, you'll only work with the subscribed CSV. Next, you'll unsubscribe the subscribed contacts you exported. 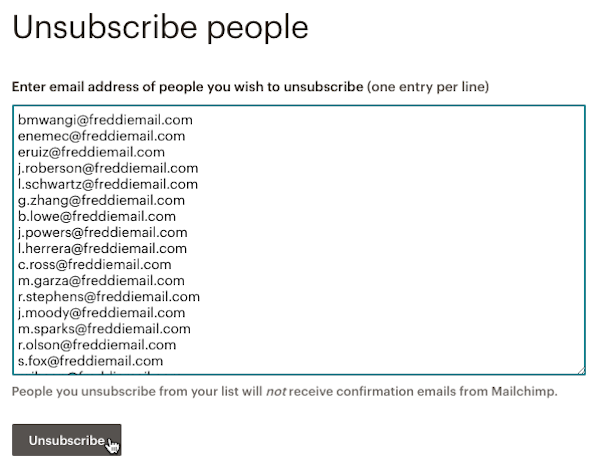 Click the Manage contacts drop-down menu and choose Unsubscribe addresses. Open your CSV export file of subscribed contacts and copy and paste their email addresses into the field. After the addresses are unsubscribed from your email marketing, you'll send a reconfirmation messages. In your reconfirmation message, you'll include a link to your signup form so that contacts can opt back into your email marketing. To find your signup form URL, follow these steps. Make any changes to your form, as needed. Copy the URL from the Signup form URL field. To send your reconfirmation message, create a brand new email outside of Mailchimp. We recommend that you use your regular email client and email address, so that your contacts will recognize the sender. Copy the subscribed addresses from your exported CSV file into the BCC field. Craft a message that asks recipients to resubscribe to your emails. Include the link or links to your Mailchimp signup form somewhere in the body of the email. Consider including an explanation of the types of campaign content you'll send to these contacts. Many users send links to past newsletters, or to a new sample newsletter, as well. You're all set. As you send campaigns to these reconfirmed subscribers, you should see healthy engagement. To keep up with their information, include an Update Profile link in every campaign you send.